Technology's forward march will require us to reconsider and even rewrite the rules of war. Clubs to cannons to rifles to drones: that weapons constantly improve is taken as a given in the military. Today more than ever, ceaseless research and refinement have made weapons more effective while reducing the need for human contact between adversaries. A 2012 report by the British Royal Society suggests that about one-third of all research worldwide is devoted to military technology. Unmanned aerial drones are the most prominent weapons of the twenty-first century’s rapidly expanding repertoire. Other arms seem similarly at home in science fiction. In the United States, naval researchers are at work on an electromagnetic rail gun that abandons chemical propellants (e.g., gunpowder) for magnetic power, hurling ammunition across long distances at speeds approaching 2.4 km (1.5 miles) per second — roughly seven times faster than the speed of sound. Similarly, the DREAD Weapon System sparked excitement and skepticism over claims that it could fire 120,000 rounds per minute without recoil, sound, heat, or muzzle flash, and critically, without jamming. An M-16 rifle, for comparison, can shoot “only” 900 rounds per minute. These futuristic weapons do not necessarily change war, qua war; they are upgrades, more efficient versions of the old weapons. In World Order (2014), Henry Kissinger wrote that modern technology “challenges all of historical experience. It is ubiquitous but not threatening in itself; its menace depends on its use.” The electromagnetic gun does not change what war is, or how we fight wars. 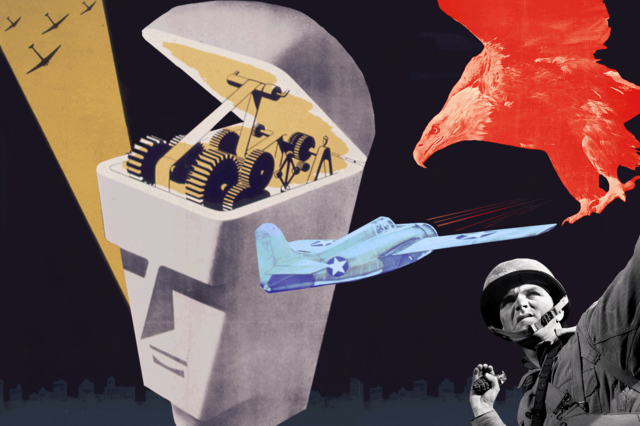 But in an era of the “internet of things,” synthetic biology, nanotechnology, and electromagnetic guns, technology might also allow for weapons that do just that — that is, force us to reconsider centuries of military thought, craft, and norms. One of these hypothetically imminent tools is quantum stealth, a so-called “invisibility cloak” that bends light with meta-materials, making the arms and soldiers invisible to human eyes and radar systems alike. Camouflage has long been ruled permissible under customary laws of armed conflict, but international humanitarian law demands that civilians and combatants be distinguishable. With optical camouflage, though, it’s easy to imagine a situation where a cloaked soldier could stand undetected amid civilians while opening fire on enemy combatants; any counterattack would inevitably mean firing back into a crowd of civilians, a challenge to the principle of distinction. “Disruptive innovation”promises to change what we think of as a soldier. It may also change what we think of as wartime. Other proposed technologies, though still a long way from being realized, pose even greater ethical problems. “Disruptive innovation” promises to change what we think of as a soldier: artificially enhanced soldiers with psychical and cognitive powers well beyond normal human capacity. It’s a project that draws on the work of neuroscientists, pharmacologists, engineers, and robotics experts, among others. Here, the line between therapy and enhancement is often blurry. Numerous therapeutic methods, some routine for decades, can be construed as soldier “enhancement.” Forms of regenerative and performance-enhancing therapies already exist to treat degenerative conditions. Somatic gene therapy, though very much inchoate, alters a patient’s genome, purporting to restore deficient cellular functions. Neuro-enhancements, like deep-brain stimulation or brain-computer interfaces, repair motor or cognitive skills, but potentially could enhance them beyond natural capabilities. For amputees, prosthetic limb technology has advanced to such a point that many injured troops who undergo limb amputations are able to redeploy into combat. There are fundamental differences, though, between using deep brain stimulation to treat neurological disorders, pain, and depression, and using it to boost soldiers’ brain functions or eliminate their pain or aberrant moods. Soldier enhancement is now a distinct and separately pursued agenda than soldier therapy —one that benefits from generous state funding. In early 2014, the Pentagon announced its plans to experiment with the use of electricity to stimulate troops’ brains, making them better able to cope with depression and sleep deprivation. Those efforts are complemented by DARPA, a tech research and development agency within the U.S. Defense Department, whose planned pursuit of soldier enhancement reads like the stuff of Hollywood blockbusters: Herculean stress resistance, improved immunity from injury or illness, jetpacks to enable any soldier to run a four-minute mile, underwater propulsion devices that enable humans to swim like fish, and climbing aids that allow soldiers to scale vertical walls “just like Spider-Man,” in the words of the Washington Post. Soldier-enhancement encompasses an incredibly vast array of techniques, and a virtually limitless amount of opportunity and risk. Evolving war technologies will rewrite the balance of power in military operations and raise urgent questions for lawyers and policymakers. The coming era of enhanced weapons and super-soldiers will simply outmatch our existing ethical, customary, and legal norms of warfare as inscribed in international law or the Geneva Conventions. We don’t necessarily need to rewrite every statue, but we cannot afford not to read them with new eyes. Technology’s forward march will require us to reconsider and occasionally rewrite the rules of war. Some of these technologies will raise such profound ethical dilemmas that they may require decades to solve. Given our very limited knowledge of the potential harm caused by emerging weaponry, past standards of “excessive harm” might need to be reinterpreted. Since the 1907 Hague Regulations, international humanitarian law has rested on the general principle that the “means of warfare is not unlimited.” The Geneva Conventions of 1949 reaffirmed this, outlawing any weapon that caused “unnecessary suffering,” “superfluous injury,” and “long term and severe damage to the natural environment.” No one can say for sure what any of the Geneva weapons criteria will mean in an age of invisible super-soldiers and magnetic machine guns. Nanotech-infused weaponry and modifications, like flame retardant guns or electrically conductive clothing, rely on manipulation at the atomic and molecular levels. It’s easy to imagine resultant “severe damage to the natural environment” or health risks arising from such atomic engineering. If a soldier is augmented to withstand any amount of physical pain, would the notion of torture become obsolete? We also don’t know how military technology will change the profile of the average soldier. Recruiters might privilege certain profiles, like fast learners and risk-takers. Or perhaps standards for enlistment would be lowered: since enlisted troops would be artificially optimized for certain tasks on the battlefield, their natural features could be less relevant. In 2013, Patrick Lin took to the pages of the Atlantic to muse about the possibility that an enhanced soldier, no longer resembling a human, could proceed to indiscriminate killings, unable to distinguish between child or enemy combatant — a living, breathing, antipersonnel mine. How would we punish that soldier’s act? Who should we punish? The soldier, the designer of the enhancement, those who set the policy that led to augmentation? In the imminent future, it is likely that the military will treat soldiers to withstand more than 72 hours of unbowed alertness, with limited stress and maximum resistance to pain. If a soldier is augmented to withstand any amount of physical pain, would the notion of torture become obsolete? Such questions touch upon deeper matters than wartime jurisprudence. They question, in fact, what it means to be human. “This is the first war in the history of mankind in which airships have been used systematically and with great effect,” wrote Coleman Phillipson in 1915. “Only a short time ago, few persons could have foreseen the great possibilities of air locomotion. … Just as the invention of gunpowder radically altered the character of warfare, so has the invention of aircraft. … The methods of belligerent operations, as we have been accustomed to understand them, will fall into disuse, and the entire art of war will be revolutionized. … Future wars will be transformed into mere contests of mechanical science and nerve.” One hundred years later, we have reached that moment: Phillipson’s prediction of “contests of mechanical science and nerve” is our reality. Every generation is forced to wrestle with the profound questions at the intersections of war, peace, and human progress. In Phillipson’s time, one such question was whether nations had sovereignty over the airspace above their territories. Later generations decided issues ranging from prisoner treatment to the safety of civilian populations to the definition of torture to the standard of acceptability for weapons. Those laws and standards are our inheritance. Although the innovations now on the horizon lack a clear precedent in both scope and depth of their effects, the core questions — how to govern war, how to create the least-bad means of conducting it, how to minimize death and destruction of noncombatant targets, what we see as fundamental and inalienable rights afforded to every human — remain the same, and the ferocity of their urgency grows by the day. Nayef Al-Rodhan is a neuroscientist, geostrategist, an Honorary Fellow at St Antony’s College, University of Oxford, and Senior Fellow and Head of the Geopolitics and Global Futures Programme at the Geneva Centre for Security Policy. He is the author of The Politics of Emerging Strategic Technologies: Implications for Geopolitics, Human Enhancement and Human Destiny.